and the rest of my feet. we’ll run and kick rocks. shall we dance, and leap and twirl? and stuff you with a squirrel. and pretend you’re each a glove. to wherever my heart desires. until it’s time for my nappy. my friends, as soon as we close our eyes. Today’s NaPoWriMo prompt was to write a children’s poem. I thought of Little r, my grandtoddler, and how much he loves his red boots. This one’s for him. Love this day in the life of Revy’s red boots! Thanks, Victoria. 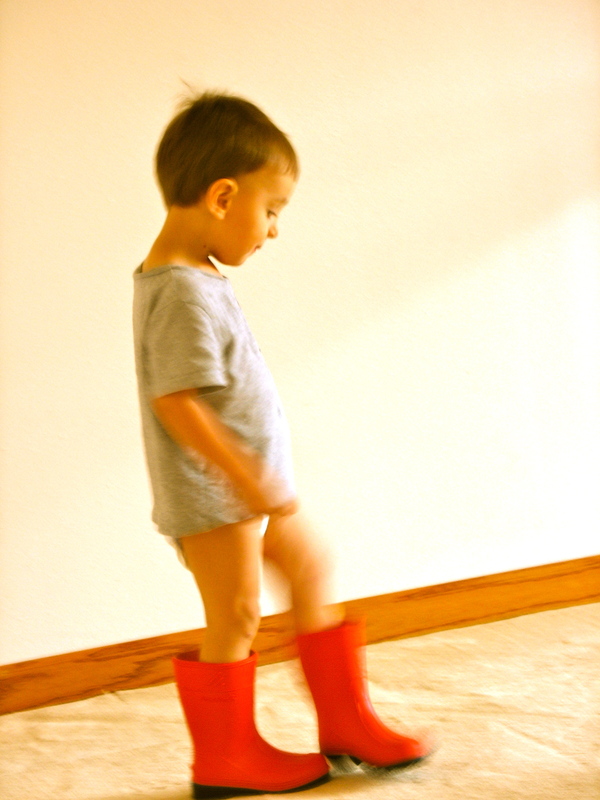 He is about to outgrow his red boots, little guy, so I guess we’d better find him a new pair when I’m in Fairbanks! Thank you, cg! I’m sure you know about grandkids and their love of certain items. When I was little it was my turquoise poodle skirt and later my purple and lime green turtleneck. Now it’s my Haflinger wool slippers. I really love them! I went from here to Indigo Blues, by chance. I love indigo, and saw the title at the bottom of this post. What a starling change. A wild toad ride. Ha! That’s a great way to describe it, Katie. Dark to light, repeat. I love the image of the boots at the door…think maybe I’ll grab Little r’s when they no longer fit. Yes, Lisa is a great writer and I love her personality. She’s a delight! Little red boots by your door is just a sweeet thing! You’re good—such range—and always that musicality–filled with an exuberance. Thanks, dawg. What are the little red boots in your life? Hi GS! Yep, child’s play. Nothing like it, eh? Thanks for stopping by. Your poetry is a terrific find. I came here from Jeff’s site where you got a Jeffster award. Jeff sure turns up treasures. Thank you so much, weavergrace! I had no idea that I’d been honored with this award! And thank you for coming to visit me! I can’t wait to see what you’re up to.